Sometimes, the next big idea that helps your business comes from an idea sparked by another person. That was the theme of the inaugural Heavy Duty Trucking Exchange, which focused on promoting networking between fleets and suppliers, as well as educational opportunities revolving around the theme of innovation. Held May 8-10 at the Scottsdale Resort at McCormick Ranch in Scottsdale, Arizona, HDTX brought together a small group of trucking executives and hosting suppliers. 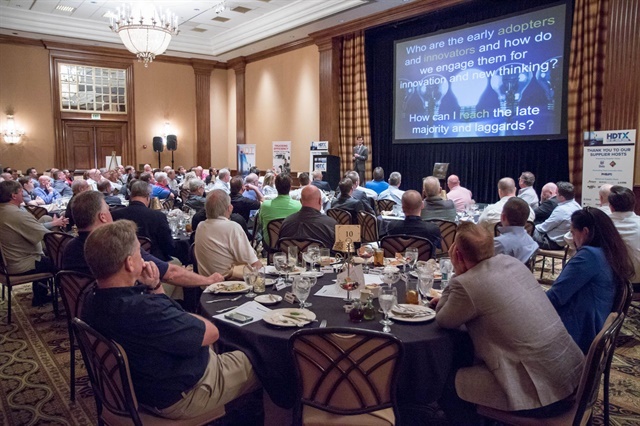 One of the highlights of the event was the presentation of HDT’s 2017 Truck Fleet Innovators, sponsored by Phillips Industries, followed by a panel discussion with the Innovators that focused on using data effectively and getting the most from your employees. When asked about leveraging data effectively, Kirk Altrichter, vice president of fleet services, The Kenan Advantage Group, North Canton, Ohio, said that not all data was “actionable,” and stressed that a first step in using incoming information is to concentrate on relevant data. Building on that theme, Randy Swart, chief operating officer, A. Duie Pyle, West Chester, Pennsylvania, emphasized identifying the issues you’re trying to resolve and then building your data-collection efforts around them to eliminate distractions. All four honorees felt it is crucial to engage with employees at all levels to encourage active participation and buy-in on procedures and efficiency. Randy Obermeyer, terminal manager for Batesville Logistics, Batesville, Indiana, said his primary goal is to build an “army of problem solvers” in his shops who can tackle any challenge that comes their way. Kicking off HDTX was an address by Jeff Sass, senior vice president, North America Truck Sales and Marketing, for Navistar International. “Connected trucks is really where the industry is headed,” he said, and discussed the advent of truck platooning, electric trucks, and autonomous vehicle technologies. “Now, do I believe that on I-10 out here at 3 o’clock in the afternoon as my wife is driving my two daughters to soccer practice that there will be a truck with no driver in it? No. But there are short-term applications where driverless will make sense,” he said, pointing to long lines of trucks at ports waiting to pick up containers and operation in a fleet’s own terminal yard as potential examples of good uses for “driverless” trucks. Keynote speaker Tim Richardson spoke on the topic of how to spark innovative thinking. “You can’t transform an organization until you transform its thinking,” he said. It’s important to teach people how to think, to give them freedom to do so, and to thank them when they do. If you penalize people for coloring outside the lines, for thinking outside the box, you may squash them from being the very innovative thinkers your company needs. A closing presentation by Tom Gauerke, national fleet account manager at Chevron, on heavy-duty OEM and oil industry trends. For more information, visit www.heavydutytruckingexchange.com.